This morning we headed to Sandy Beach along this path that we haven't been on since the flood in December. Have you noticed that we AREN'T on leads? We didn't have to wear them the whole time! See Bella's banana tail, that means a grooming session coming up. There were LOTS of interesting things to investigate! When we got to Sandy Beach, the Dragon Boat rowers were leaving for a practice. If you look VERY closely, you'll see me, Daisy, in the water helping them start off. However, there were much more interesting things along, and in the water. Bella (banana tail) in foreground and Daisy in back. We watched them go down the river. Then got back to business. We zoomed around through the gooey mud and sand. Paddled in the water. Chased rocks that were mysteriously falling into the water. We stayed for a long time, then walked back to the car. We know it was BATH DAY and not just because we were messy because Kendra had to have a bath, too, and she only went on the early morning walk and wasn't dirty. Thought we'd better explain the cat head sign! Cat heads are a particularly nasty thorn. They're about the size of a pea, though that can vary, and have hard, sharp spikes sticking out on all sides. They are very painful if stepped on, and can prick fingers when removing them. They have been known to puncture bicycle tyres. We didn't find any that day, because if there is anything sharp around, it ends up in Kendra's paw! So the real kitties are safe around here (except from us). Things around here have been so slack busy, that we nearly forgot we were given this awesome award by Leroy and Sherman at newfies1.blogspot.com. Firstly, we'd like to thank them. 1. Daisy is the largest of us, then Bella and Kendra, though Daisy says she just has thick skin. 2. Bella buries toys, Kendra plays with balls and Daisy likes tug-o-war If the human is involved. 3. Bella has the most expressive ears and likes cuddles. Daisy and Kendra just like to be near HER. 4. Whenever there is a snack or food, Daisy always sits back and lets the others be served first. But guards her share fiercely. 5. Daisy is always first for grooming. 6. Daisy is the friendliest to other people, Kendra hates everyone, and Bella is in the middle. 7. When Bella sees an approaching dog, she moves into a stalking position--body lowered and ears flattened. She looks like a cat sheep dog. Now comes the hard part, passing the award on. We've decided to send it to some Newbies. Bella has claimed the new ottoman as her bed. I went to the Farmers' Market this morning. I was given the responsibility of choosing the treats. You sure I just can't say one of each? There was so much stuff to choose from. Daisy tried to run off with the whole package of Roo Chews, but didn't get very far. Roo Chews, Lamb's Delight, Pig's Ears and Kangaroo jerky. Ya Done Good, FG! We've read about all of you saving green papers to make donations. At first we were a bit confused. Then we decided to save up some green papers, too, to give to the dogs and cats at our local shelter. check out our GREEN PAPERS! See why were a bit confused? We like this commercial and think it's a good one for Valentine's Day. Do you remember a few weeks ago when we were imprisoned put in a bedroom and when we came out our furniture was gone? This morning we were locked outside and a huge truck arrived! We told it and the two men, very loudly, to get off our property. When we went back inside, look what we found! Bella immediately jumped up to test it out. 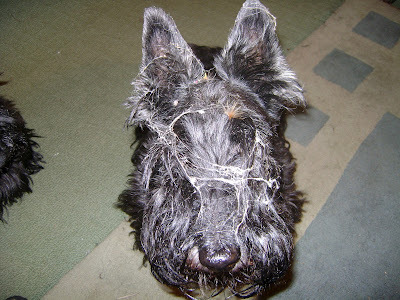 It's been scotch terrier guarded--or something like that--so we can't get it dirty very easily. It's not like the old one, smells a bit funny; but I think we can live with it. Bella: I don't think those birds need ALL the bread. The ducks and swans followed us all around the pond. Me (Daisy) telling those birds we don't have anymore bread. We love to walk right along the edge. We told you 'There's NO MORE BREAD! We're still here, just too hot to do anything. A week of hot (100-107 F), humid weather makes us too tired to do much. So after our long early morning walk, we can be found in various positions around the house snoozing....waiting for dinner and our evening walk. Bella had a trip to the vets' yesterday. She's been scratching like mad.....driving HER nuts. Can't find a reason, probably a plant she rubbed against at Millie's. She's on some tablets. That means Bella's tablet is wrapped in cheese and Kendra and I get some cheese, too! We love sitting out here in the morning. Kendra does the dusting. We've just been reading about all of you under snow! Hope you are keeping warm and that Ground Hog does the right thing. Maybe he won't even be able to get out. Of course we are just the opposite. We went for our walk this morning in the cool. Cool being relative as it's already 77 F and humid. We're not used to humid. Today will be over 100 again. It always happens just as school goes back for the year and school started on Monday. School doesn't affect us too much, except that we have to keep all the front windows and doors shut up because some dogs in this family, and I'm NOT one, bark like crazy at all the kids. So we can't sit in our favourite spot out front early in the morning. Also, sometimes SHE disappears all day and comes home at dinner time. Looks like another day for sleeping; but I suppose all you snow dogs will be doing the same! Sending you WARM thoughts.